The Going-to-the-Sun Road, that enigma of American beauty and fickle weather conditions, is one of the most spectacular roads in the country. With spring comes the chance to explore the well-trodden path through Glacier National Park in a new way, on two wheels. 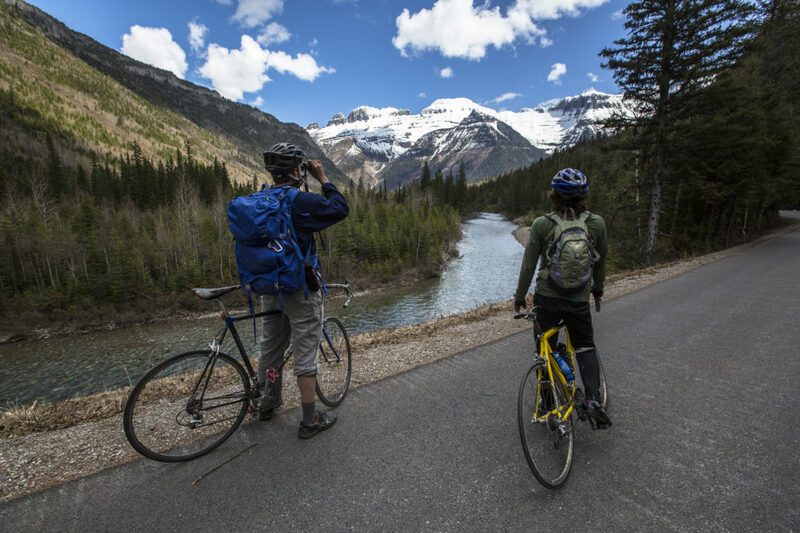 During plowing season (April-June, depending on that year’s snowfall), the Going-to-the-Sun Road is open exclusively to bicyclists and pedestrians on the west side of the park beyond Lake McDonald Lodge. The season gives visitors a chance to experience the beauty of the region in a way that few people do. Soak up the views from the road and get a workout in as you climb, then head to Flathead National Forest for prime mountain biking trails. Click here to check the current road status. For ease and simplicity, we offer bike rentals to our guests. Our on-site fleet of four mountain bikes can take you from road (inside the park) to trail (right next door in the national forest). Call (877) 387-4420 or visit our front desk to reserve your bike!